Scavenger Hunt | Kris Johnson's Blog…sort of. I feel a bit remiss for failing to mention this before. 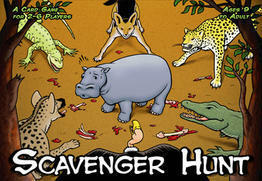 Goodman Games presents Scavenger Hunt, a carrion-collecting card game for 2-6 players. Game design by Gunnar Hultgren (AKA Miscellaneous G™). Art by Brendon and Brian Fraim. I had the pleasure of being introduced to Scavenger Hunt several months ago, when it existed only on index cards. Though I haven’t picked up my own copy yet (Comic Heaven was sold out last week), I’ve seen the deck that Miscellaneous G™ used to run demos down at GenCon last month and it looks incredible. The art is fantastic and funny, the card layout is sharp, and I know from experience that the gameplay is a lot of fun. Previous PostWhither KJToo.com?Next PostSerenity now!